I woke up to a big breakfast of French toast and strawberries. At 10am, Kevin helped me down to the beach with my equipment and I was on my way within an hour. It was a pretty boring day out on the water. I cut straight across Half Moon Bay, so for five hours I was about 2 miles out from land and the scenery didnt change much. The swell was 15 feet high, but it didnt bother me since it was going in my direction. One time, I got a little too close to shore( I was still over a quarter mile from the beach), and the wave I was traversing started breaking on my right-hand side. It scared the crap out of me, but I stayed calm, and quickly pointed the kayak toward the crest, and paddled like mad. I flew off the back side with a "Yahoo!" and a "thump". The only other excitment occured when I came upon what looked like a shark fin. It, most definitely, was the fin of a large fish. I could see four inches of a fin sticking out of the water, and a gray body underneath. It was only ten feet away when I first saw it, and didnt dive out of sight until I paddled over within five feet of it. When I got close to Pigeon Point, the waves were crashing violently against the shore. Fortunately, John had recommended a protected little cove just south of the lighthouse for me to take out at. After an effortless landing, I pulled my boat above the surf line a safe distance, then walked up the hill to check out the Pigeon Point Lighthouse Youth Hostel. On my way back to the beach I got a cyclist who had just arrived at the Youth Hostel to help me carry my kayak up from the beach. After dinner, I knocked on a house, attempting to get my email. It was the only house for half a mile. A man got up from his chair in front of the TV and answered the door. "What do you want?" He asked. " Im on a kayaking expedition, and I was hoping you would allow me to use your phone to get my email." "Sorry Bud..." the man responds, "Im way too busy." "Okay... I understand." I said. He shut the door, and I walked off into the night. Sometimes there is just no point in arguing. It had been a long day, and by 8:30pm I was bushed. I crawled into my Gore-Tex bivi sack and went to sleep on a small field of rubbery little plants, on a hill above the beach. During the night, I had a vivid dream. I dreamt that my kayak had gotten bashed up, and was no longer sea-worthy. I didnt know how it got that way, but it was in really bad shape. I woke up very scared, but after sitting up, and seeing that my kayak was in good condition as I had left it, I felt much better and went back to sleep. Before business started for the day, I went to the hostel to get my email. After receiving my email, I sent a quick message to my parents telling them that I was okay, and that I would write them again when I got to Santa Cruz that evening. For breakfast, I had a large plate of Smern(Which is German for chopped up pancakes). I learned the recipe from my German rock-climbing friends. Then I got an Italian surfer to help me carry my kayak back down to the shore. The tide was at its peak, and there was only thirty feet of beach between the cliff and the surf. Below the cliff next to my boat was a small fishing dory. "Maybe I should tie my kayak to the dory, just in case." I thought to myself as I walked up the small hill to get my first arm load of gear. Then I thought, "Nay... Ill only be a few seconds, and Im just a hundred feet away." Upon hitting the beach with my third arm load of gear, I couldnt believe my eyes. It was gone... My kayak was gone!!! I dropped my arm-load of gear, and climbed up onto a rock out-cropping at the end of the beach. There, to both my shock and relief, I found my kayak, upside down, and being bashed around in a rock garden. I was only wearing my shorts, a polypro long-john top, and neoprene booties, so I waited until the boat drifted in a little closer before jumping into the frigid water. The surf was crashing against the rocks around me. It was hard to know what I was getting into once I stepped into the water. I got pushed around a bit, but, eventually, I was able to pull the kayak up out of the water and onto some rocks. I tried bailing the water out of the cockpit, but with each wave, it filled back up again. A big wave helped me lift it off the rocks, and back into the water. After a bit of frantic splashing around, I was able to haul the boat up onto a seaweed-filled notch along the base of the cliff and start assessing the damage. Upon exiting the water, I noticed my left leg was covered in blood from the knee down. There were no deep cuts, so I went back to taking care of my boat. 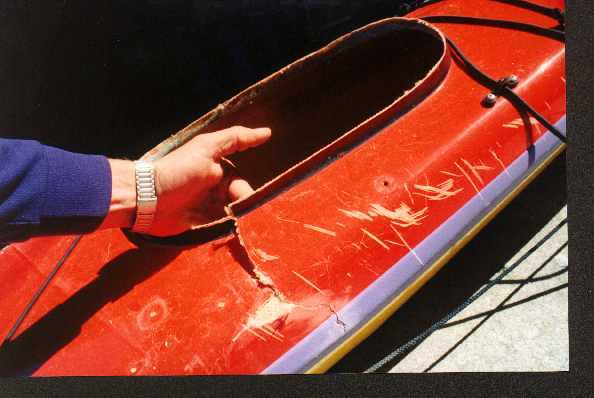 Several areas along the bow suffered serious stress cracks and the gel coating had broken off - exposing the kevlar underneath. Besides a few pokes and some small holes, the rear hatch cover is busted in half, the coaming is completely gone, and there is a five inch tear in the kevlar from the hatch opening to the water line. In my rear hatch, I had my Therma-rest chair kit, an open map case containing my "How to Play Harmonica" book, and a bunch of addresses from the people Ive met so far on the journey. Losing the addresses was the worst blow of all. The rest could be fixed or replaced. Fortunately, I had locked my front hatch cover - which may have been the only thing which kept the kayak floating. Once I got back onto the beach, I called to a guy who had been watching me from up on the cliff. He helped me carry my kayak, and within half an hour, I had all my equipment back up on top of the hill. As I stood there, wondering what to do next, I spotted a helicopter coming toward me in the distance. I grabbed my VHF radio and made a call... "Coast Guard helicopter, this is MAX CFD8908 - message over." "MAX, this is Coast Guard helicopter. We read you load and clear - over." "Coast Guard helicopter, do you have orders from Commander John Williams to video a kayaker on the water? - over." "That is affirmative. Where are you located? - over." "Heading in a south, I am on land 300 feet to the left of the Pigeon Point lighthouse. I am waving a yellow bag.- over." The helicopter then circled around me twice while taking video. Before departing, they told me to let them know when I would be heading out again, and they would come back and get more video. I thanked them very much for coming out today. I knew the next step was to get ahold of John Dixon, since he was the only person I knew in the vicinity. I tried phoning him but no one was home, so I decided to hitch-hike to his place. I got a ride with the third person I asked, a young Korean lady and her friend who were going to San Francisco. After fifteen minutes of driving, I looked out the window and saw a kayak on top of a car at a gas station. "Hey... stop the car!" I said, "I think that is the guy whose house Im going to." They pulled off the highway and I ran back to the gas station. The car was just about to pull away as I was running toward it. I jumped in front of it and sure enough... it was John! What an amazing fluke! It is now two hours later, and I am back at Johns house eating supper, with all my things securely stored in his garage.